During a shooting of a documentary for MCIIE, IIT-BHU, we got a chance to have a very fruitful conversation with Mr. Abhishek Gupta; an alumni of Indian Institute of Technology, Banaras Hindu University, Varanasi. He has over 12 years of experience managing high-growth organizations, leading technology, engineering and IT teams and bringing complex products to market on schedule. Currently he is working as the COO of Tlabs, a prime incubation cell powered by Times of India group, which is India’s leading startup accelerator and support stage providing seed fund for internet and mobile tech startups. Presently the Tlabs is a home for 50 Companies, 7 exits, $200M+ Market Cap, 160+ founders! 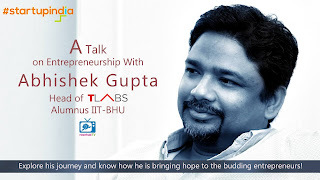 In this video he is going to explain his entrepreneurial journey, how he rises as a prominent support to budding business and the process to get incubation at Tlabs. He also has shared some very wise suggestions for all the upcoming and growing ventures.